I agree with his quote, but there are also a number of positives to take from this game that have an impact on the future, as well as some learning points for all us to ponder. 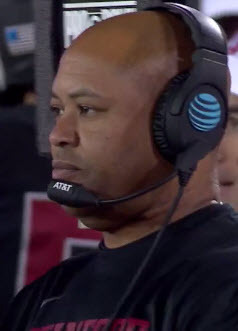 First … I have to tip my hat to Coach David Shaw, as it was obvious that while Oregon may have had some skill players in the past that kept the Ducks competitive with the Cardinal, it is clear that at the present Stanford is a much superior program in their talent, scheme and system. They know what they are going to do, while Oregon is still learning what we want to do and how to do it. The Stanford players were more physical than Oregon on both sides of the line, but I felt that the disparity in toughness was not as wide as in the past. The trenches in green are not there yet, but I heard some pad cracks through the television, and you could see some good hitting was taking place. The new culture installed by Coach Willie Taggart is taking hold. The Cardinal have stuffed Oregon’s running game in the past, and a big part of it was that toughness mentioned above. Yet 278 yards rushing (when the Cardinal knew it was coming) was pretty remarkable by the offensive line and should not be overlooked. It was a hell of a job. Oregon’s average gain per rush was an astounding 6.4 yards … higher than Stanford’s 6.0 yard average per rush? Holy Crap! 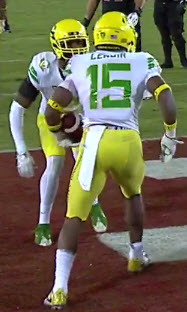 My friends, if there was ever a physical team that could shut down the Oregon running game, Stanford is it. The lessons learned last week were immediately seen, and usually when you have the most ideal situation on defense as Stanford had (an opposing freshman QB who cannot pass well yet), the result is pretty dire. It was from a scoring standpoint, but the Ducks’ running the ball against the Cardinal that well, when they had to, is something to build upon. Frankly – it’s something to be very proud of. Mario Cristobal wanted a tougher, stronger and more fundamentally sound offensive line, and the Ducks are clearly on that path, IMHO. If you look closely at the screenshot above, you see that a Cardinal defensive back (solid red line and arrow) is between the Bubble receiver group of Oregon and the box. 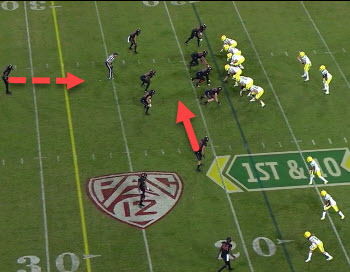 You see how the Stanford Free Safety (dotted red line and arrow) was moved up closer – that both could be in the box inside of a second once it became apparent that the helmets of the offensive line were staying down in a run-blocking posture. This means that the Cardinal actually had nine in the box for the Ducks to block with six. The play in the screenshot still went for six hard-yards, and the safety was one of the primary tacklers. That was pretty studly by Oregon’s offensive line and running backs. We are a mess right now. We also need to put things into their proper perspective regarding Braxton Burmeister; he is a true freshman thrown into it, and our play selection is quite limited by necessity. Yes … I know about other Oregon quarterbacks playing as freshmen, but Bill Musgrave and Marcus Mariota were redshirt freshmen, and that year makes a ton of difference. Oh yes — I know that Justin Herbert was a true freshman as well, but it is not fair to compare someone who was evident early as being a first round NFL Draft pick in the future, just as you and I are not the very best in our field. Let’s cut some slack to the Braxton and give him time to grow at his own pace as we have in our own careers. Yep, I am frustrated with the design of the plays where our quarterbacks are trying to execute difficult sideline fade routes (very low percentage) instead of slants or crossing routes that fit into a roll-out pass. My expectation is that these coaches are very skilled and knowledgeable, and my experience has been that if the obvious is not being done on the football field, there is a reason why, and we are not on the inside to know what it is. 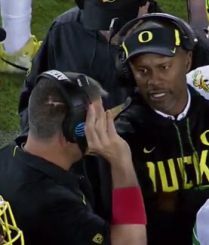 Did Coach Taggart Learn an Important Lesson in This Game? Coach Taggart was taught that in order to win “you must run the football.” Since he and his star QB at South Florida were running quarterbacks, he believes a full commitment to the running game must be made. 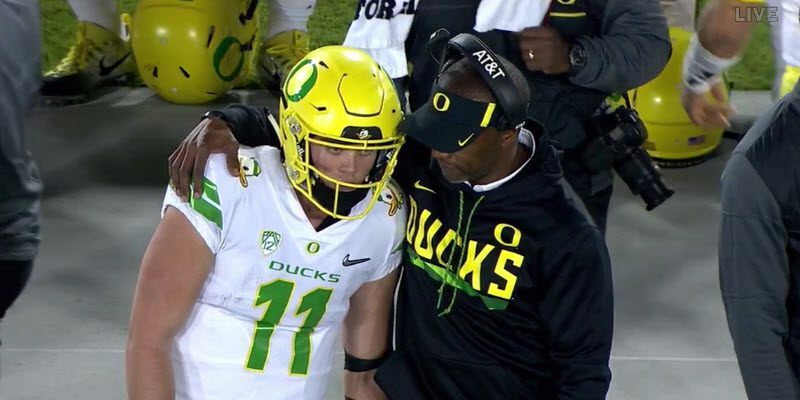 It is an important philosophy embedded in him, and it has become obvious he feels this way based upon the comments after Herbert’s injury. Yet he just had a damn good rushing game from his offense, and his team got clobbered. What’s up with that? The Pac-12 is the answer, as you cannot just run the ball in this conference and win. Oregon’s best teams in the past were balanced between run and pass, although the attention was on LaMichael James and Royce Freeman. I noted how the Cardinal had 248 yards rushing and 256 yards passing, and that is ideal. Doesn’t it make sense when you have an incredibly skilled passing quarterback (Herbert) that you drop a little out of your “running quarterback” part of the playbook to utilize his skills in the other areas (passing) that can allow Oregon balance in their offense, scoring to the degree that we need? How can I say that? Because it only takes one player not correctly defending the right gap for a play to be a tackle-for-loss or a touchdown against the Ducks, as we saw in this example last year. Oregon was down to its fourth team middle linebacker who started in this game — the same linebacker featured in the disastrous article linked above from 2016. This player was highly regarded in the recruitment process originally, yet he ended up on the depth chart behind a transfer, a former walk-on and a current walk-on. When a “Mike” linebacker messes up very often, the defense can look disproportionately bad compared to prior weeks. He was not the only reason for the 42 points put on the defense, but he had more of a factor than most fans would realize just watching the game. Above you see a Cardinal play forming. The Ducks are working at filling their gaps on defense. Note how No. 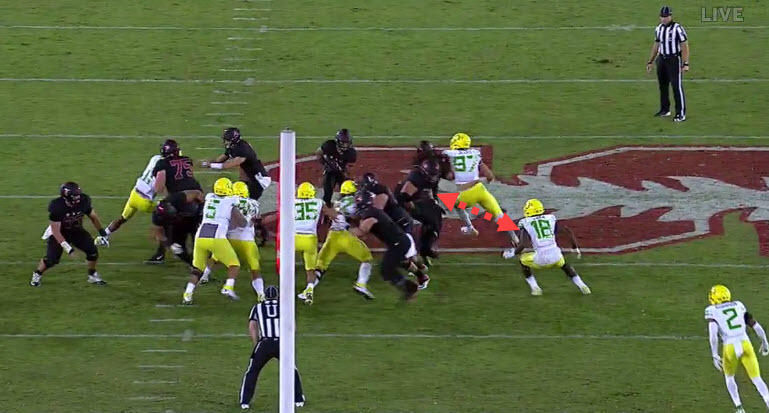 97, Jalen Jelks, has taken on the outside shoulder of the Cardinal blocker beautifully to maintain outside leverage. Thus he is the perimeter defender and drives the ball carrier to the inside. Note also how No. 18 (the aforementioned MLB) is being approached by a blocker (dotted red line and arrow above). He has some decisions to make in microseconds, and he has to do it correctly to help fill all the gaps. A year ago he gave up a touchdown by taking on the wrong shoulder, and now he uses poor technique again. He does not charge the blocker and attack the shoulder in a “dip-and-rip upward” technique as described by our Grizzled Ol’ Coach in the past. No — he waits for the blocker to come to him and tries to take the outside at the last moment. He ends up messing up the pursuit of his teammate Ty Robinson (No. 2). This play could have been stopped for a short gain and was not due to the poor technique of No. 18. That is why he was fourth team. Everyone on that play had their gaps and responsibilities right except for one man, and when it is the middle linebacker, it is a killer. I learned this last year watching film, and here we see it again. My friends, we recruit our way out of this. 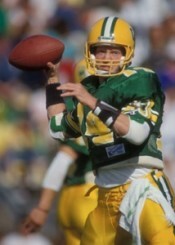 I am completely sold on Jim Leavitt and his staff. We have to acknowledge that when true freshmen such as Nick Pickett, Thomas Graham and Deommodore Lenoir are playing that much, it is not the same as a savvy Stanford secondary that put in their time learning their process and defenses. Those freshmen probably can’t walk well today with all the third-degree burns put on them by the Cardinal receivers, but we will see the benefit of this experience in the future as we have with the offensive line.